Matt Miller is one of the many former Clinton White House aides still active in politics. He's a centrist through and through. He writes well and assembles coherent arguments. 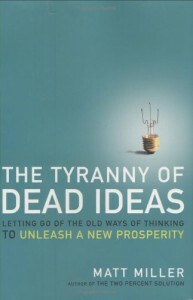 The title is catchy, the Tyranny of Dead Ideas, and he weaves this theme throughout the book. The book's copyright is 2009 and is badly dated as of August 2013.